Soprano and Bay Area native Jennifer Mitchell is an active opera and musical theatre performer and voice teacher. 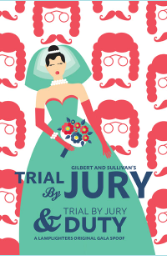 Jennifer will be returning to Lamplighters Music Theatre in March/April 2019, where she joins the cast of Trial by Jury, paired with the original Lamplighters’ Gala Trial by Jury Duty. Performances will be in Mountain View, Walnut Creek, and San Francisco. For specific dates, locations, and tickets, click here. The women of the San Francisco Symphony Chorus perform music by Debussy, conducted by Michael Tilson Thomas.